It’s not quite finished, but I think it is far enough along to show. The middle, tall building is the one that has been giving me fits. All of the work and it still isn’t quite right. The center sets of windows are a little bit too far to the right and of course I didn’t see it until after I had put them in. That was about par for the course for this picture. I think I’ll be able to disguise some of it with the pastels, but of course I will always be able to see it. I will ink in the street on this one so the bottom will be a lot darker. The unfinished upper area of the center building is brick, as are the visible sides. The lower store fronts are predominantly green which should contrast nicely with all of the brick. It will be interesting to see the differing effects of pastel versus watercolor in the finished pieces. And an update on the buck from the previous post. 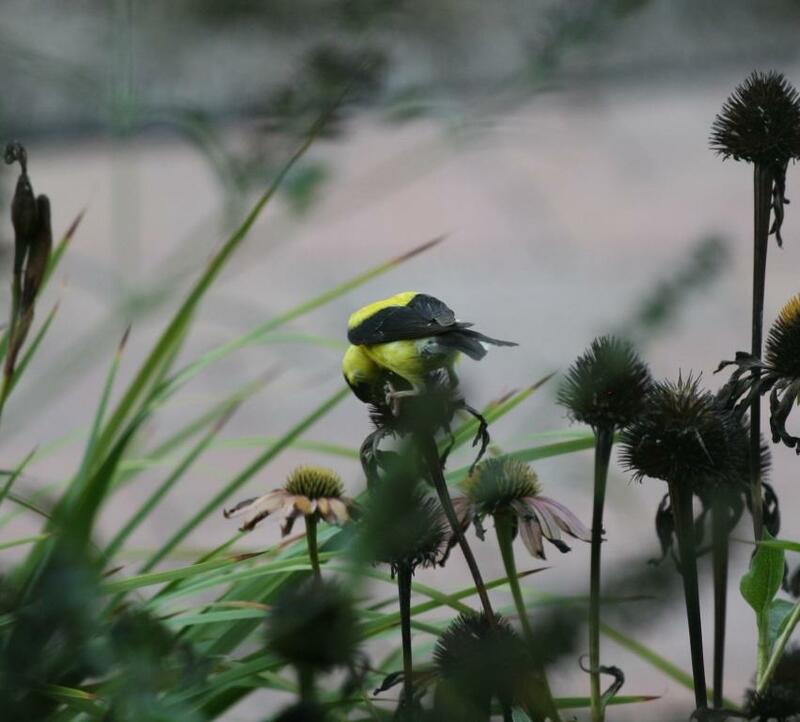 After no sightings in over a week, this afternoon I saw him crossing the driveway in the front of the house. He is still limping pretty badly, but he is alive so who can say what will happen. He seems to be spending the evenings in a narrow patch of woods west of the house, so we try to stay away from it. I finished the inking on the next picture but I didn’t feel that it was different enough to post, so I thought I’d put up a few of the wildlife photos I mentioned earlier instead. 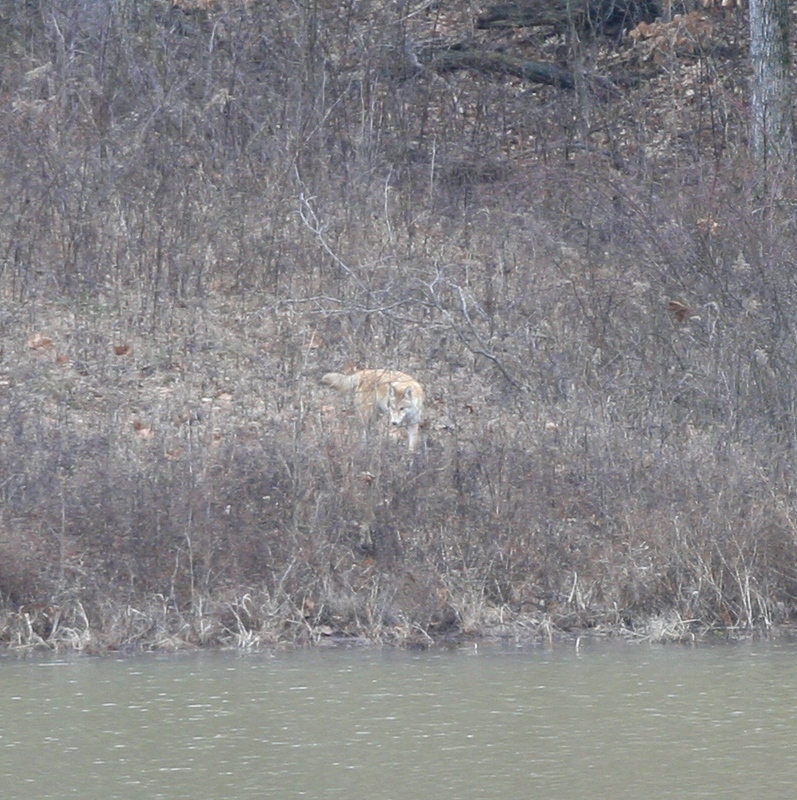 Here is the coyote hunting for his lunch. He was quite a big guy and rather blonde and in fact, until I saw his face, I thought he might have been a dog. He spent quite a bit of time over there looking for mice, voles, moles, or whatever and finally caught something. He pounced and then lay down with his catch. I couldn’t tell what he had, but he grabbed at it, tossing his head to get rid of fur it seemed, and then swallowed whatever it was. 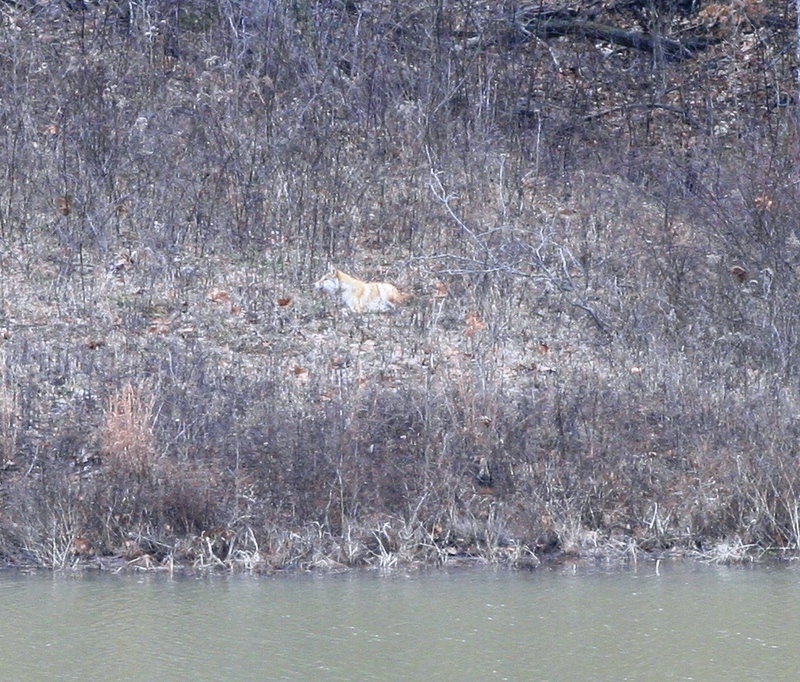 He spent about half an hour hunting over the same area, but I didn’t see him catching anything else. I didn’t see any other coyotes at the time, but we certainly have heard them a lot over the last few weeks. It is breeding season now so they are singing to themselves, I think. I am keeping my fingers crossed to see puppies again. 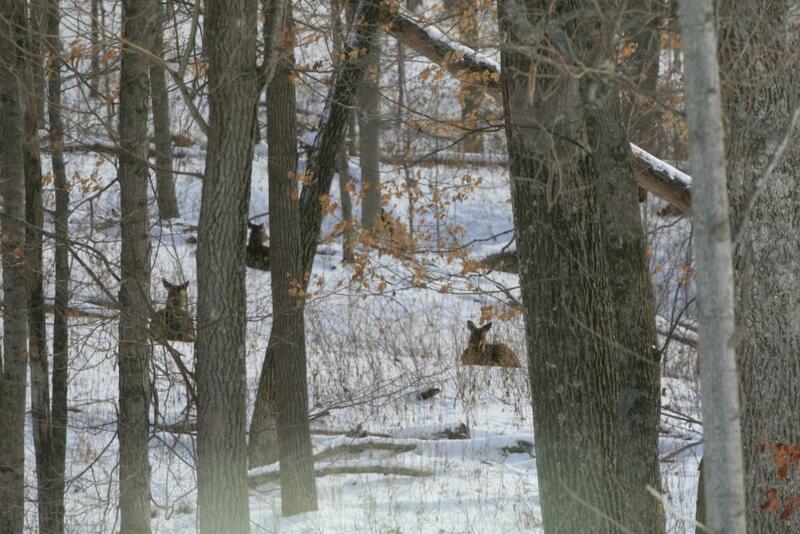 A few days earlier I saw several deer out in the back yard and just in the woods. 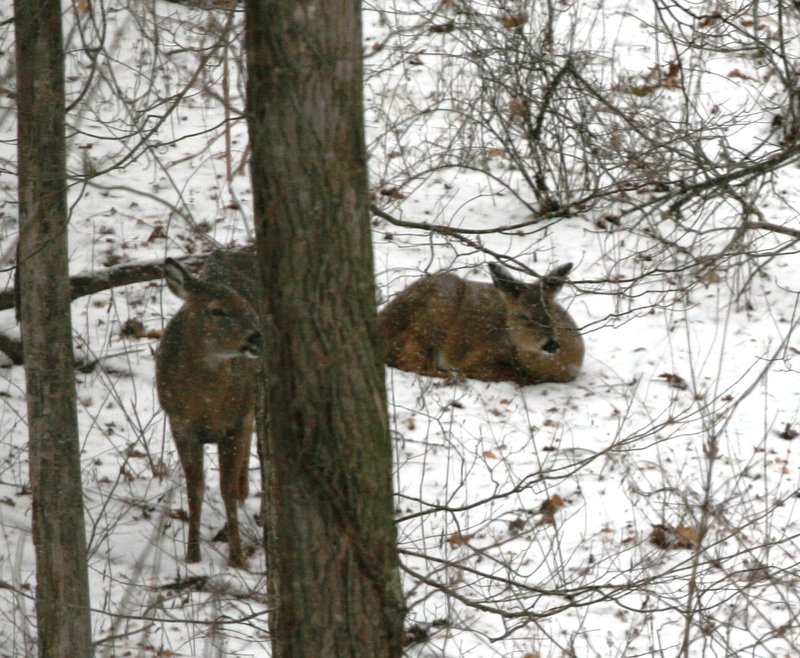 The does were resting among the trees and then I saw the young buck move out into the open. I wonder how he managed to break his antler. Was he trying to play with the big boys a little to early? Did he find out who the big boss really was? I am sure that next year he will be much more skillful. He was on the large side, so I think he might end up with a nice rack in a few years and join the big boys herd. The last of the flowers and herbs have finally succumbed to the fall frosts. The reblooming irises managed to open about half of the buds that developed before dying back and made for some wonderful fall colors.. The petunia flowers are also gone but surprisingly the plants themselves are still hanging on and actually look quite good. I hope this bodes well for them to come back next year. I love how their iridescent purple, pink, and striped blossoms have spread all over the hillside. In fact I am seeing some variations that I never bought because of the cross-pollination. I even got a few pure white ones – which I never would have bought because as you know I don’t like white as a main theme. I never was much of a petunia fan before this, but I have decided I like the way they spread and I have to plant fewer to get coverage in an area where it is hard to dig very deep. Plus they are volunteering to return on their own. 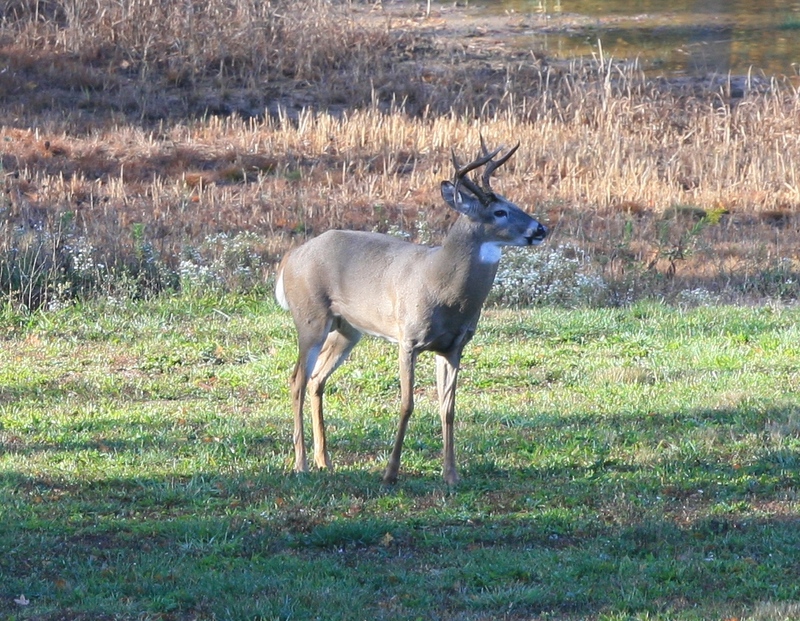 Two weekends ago deer hunting season started with a 7 AM blast and I was a little worried about the bucks that live around here – particularly the 8+ pointer. We don’t hunt ourselves but many of the surrounding neighbors do and I knew he would be considered a prize. Still, he didn’t get to live to have 8-10 points without being pretty smart and yesterday as I was coming down the last fifty yards of the driveway to the house, there he was. He stopped and I stopped. We looked at each other for about a minute before I started to edge the car on and he bounded away. I got one last glimpse of him as he turned back to watch me briefly. Of course I didn’t think to get my phone out and try to snap his picture. One of these days I will see him close up in the yard and manage to get the telephoto lens so I can actually count the times on him. I’m betting on at least 10. And finally, for the last month, my studio table has been the has been doing double duty as a drying rack for the herbs I grew and picked. I got around to stripping the dried leaves from the stems yesterday. Who knew the rosemary could be so pungent after it was dry. It actually had a piney smell to it and my fingers have had the aroma of herbs for half of the day. 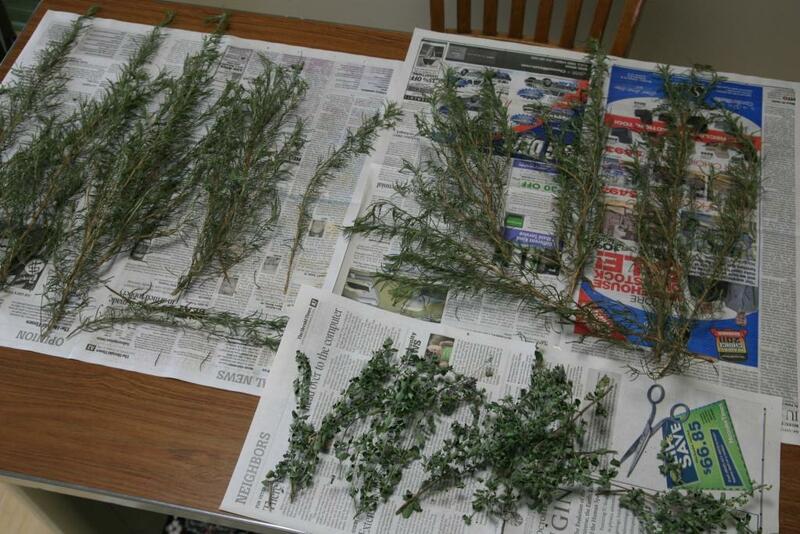 I managed to dry over a cup of the rosemary and 1/2 cup of oregano which I will use in my cooking over the winter. I particularly like to use the oregano in the artichoke spaghetti and the rosemary on the baked sweet and red potato fries. Yum. As I sit here writing this post, I can here the long-awaited rains hitting the roof above me. Today felt like the coming of fall. Yesterday was in the 90’s and today’s high was barely 70, with low flying cloud cover. I washed off my horse’s rain sheet and winter blanket in the heat of the day and set them in the sun to dry. Truth is, I should have done that in the spring when I brought them home, but you know how that goes. At least I did it before today’s cooler wetter weather set in. It has been a busy few days with a quick trip to see our son who travelled to Purdue for business. Four hours of driving for a three hour visit, but well worth it. I did manage to sneak into the studio for a few hours today. I didn’t have the time to lay out a new architectural so far this week, so I decided that since I hadn’t done any new aceos in quite a while, I would spend the limited time available doing a few. 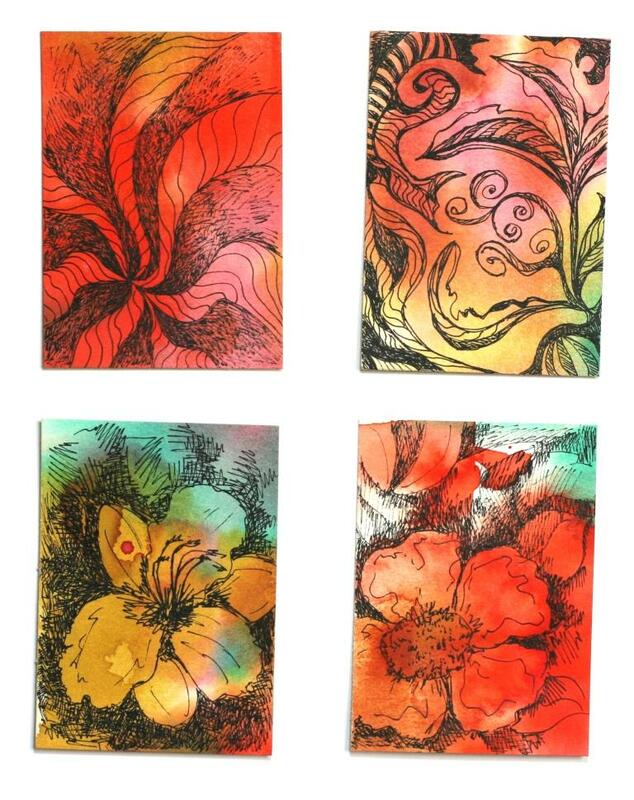 I wanted to try a few abstract compositions and the other backgrounds seemed to lend themselves to a floral motif. These watercolor blanks had a lot of orange and yellow ocher in them and were interesting to work with. Many of the previous pieces were more red and green in tone. I may do a few more this week and then list some in my store on Etsy. 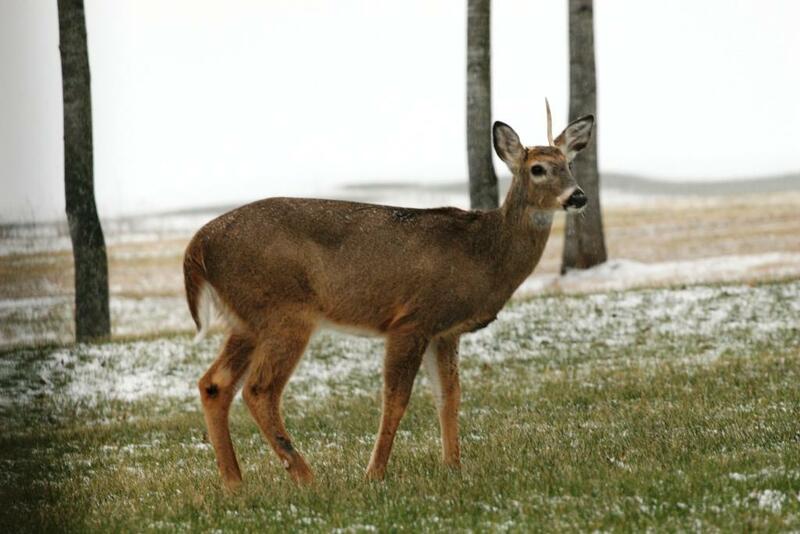 And here is the photo 0f the oddly colored deer that I promised a few posts back. They are actually that white. I’m thinking it must be some coat/skin condition. Even the more normally colored ones had splotches of white on them. I hope it clears up before winter and is not an indication of some more serious health issue. And, as you can see, the buck is getting quite a set of antlers. I’d like to find those in the spring. Wouldn’t you? When I pick berries it is not in the carefully laid out rows of a commercial operation. It is out on the edges of our fields and rife with the potential for difficulty and excitement. There are wild rose bushes to grab skin, hair and clothes and while the blackberry bushes are not quite as lethal, they are not much better. Then there are the chiggers. For anyone who does not know, these little mites will drive you to distraction with a red bump and serious itching that lasts for days. I’ve never seen a snake, but I’m sure I came close a time or two and didn’t know it. 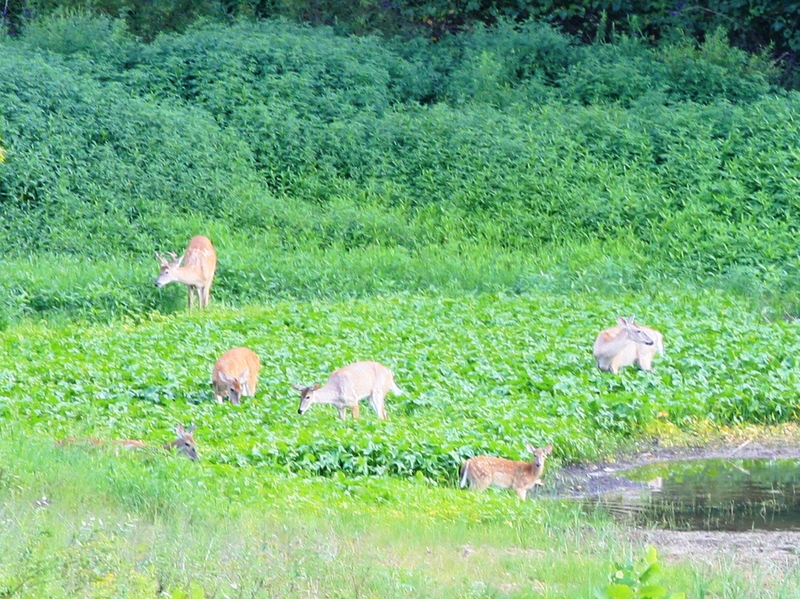 The rapidly approaching blackberry season and the appearance of the first fawn in the yard put me in mind of an adventure my Great Pyrenees mix and I shared some years ago at our last home. Like here, it had large fields surrounded by black raspberry and blackberry bushes where I was able to pick gallons and gallons of freshly ripened fruit. She loved to accompany me on my meanderings around the fields, relaxing in the shade when I found a patch to pick. We were lazily moving down the edge of the woods to a little outcrop that was mostly berry bushes and a few smaller scrubby trees. We had been out about an hour, me juggling three buckets half filled with fruit and her following. Suddenly, directly in front of me, a large buck with a huge rack leapt out of the underbrush. Leaves, branches and who knows what else went flying though the air in all directions as he crashed out of his supposedly hidden bedding spot. We must have jumped about three feet into the air. Brandy was so surprised she didn’t make a sound – not even a woof. We looked on in startled silence as the huge buck bounded away, his sleep rudely disturbed and with vines and underbrush hanging from his large rack. It was quite a sight. Brandy looked back at me as if to say What Just Happened? All I could say was Wow! After we caught our breaths and our hearts started to beat again, we continued on with the picking, once again treated to the wonders of nature all around us. I’m taking a short break from the art experiments right now for a very good reason. 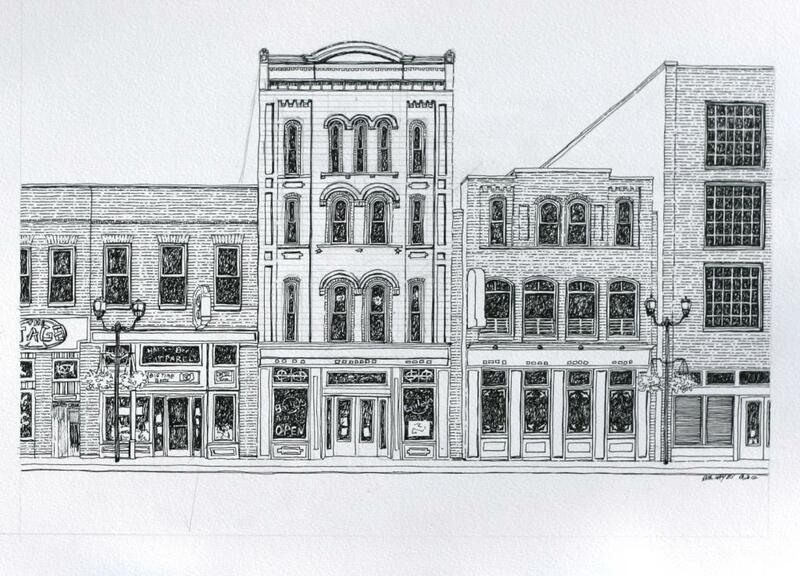 I just started on a commission home portrait of a cute town home that will take me into the weekend or thereabouts. I’ll post it when I’m done.